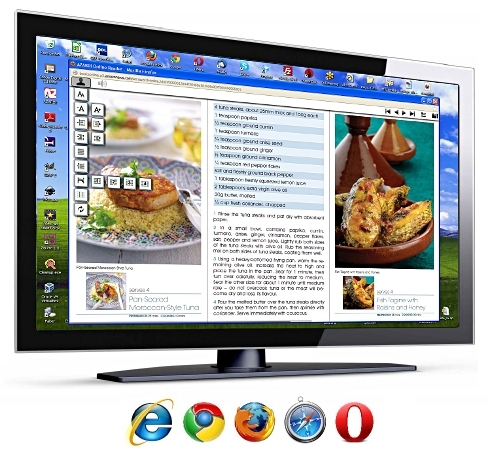 AZARDI Online brings the advanced ePub reader features of AZARDI Desktop to browsers everywhere. AZARDI Online is designed for publishers who need to deliver their content to wide audiences everywhere. Standards compliant ePub 2 and ePub 3 books can now be made securely available in browsers everywhere. CONTACT US for more information on using the AZARDI Content Fulfilment with the AZARDI Reader family for your publishing business. The AZARDI OL delivery platform has both a preview and full read mode available for your valuable content. The AZARDI OL preview mode allows publishers to promote their ePub 2 and ePub 3 books with a preview before purchase option. This can be linked from any site. If the linking metadata is provided the books can have sales links to the e-retailers of your choice. Content security is assured because the preview ePub spine is reduced to just the sections you want to show. The full read mode is accessed by an authorized user from an account controlled by the publisher from their own bookstore or lending system. Books can be subscription period controlled. All book access is controlled with user/account/site authentication and authorization on every reading session. If you are a researcher, academic, student or just an avid reader, AZARDI OL lets you engage with and personalize your content engagement from the largest to the smallest monitor like never before. AZARDI OL is optimized for easy reading, scanning and browsing documents on large or small monitors. The control is in the hands of the reader. You can set flow or pages with 1, 2, 3 or 4 side by side pages. Font size, margins, and line-height have infinite change, justification and hyphenation can be instantly turned on and off. Your settings and reading position are saved independently for every book. If you get a bit messed up, the reset button instantly restores the default presentation. See all the features here. Audio books everywhere! AZARDI OL lets ePub3 books with audio play everywhere. No special software required. The powerful AZARDI OL upload preprocessors make sure all audio for all browsers is present. You supply any audio format, all other required audio formats are automatically created so your audio works on all browsers.